Classical Up Close 2014 starts tomorrow, Friday, April 18. 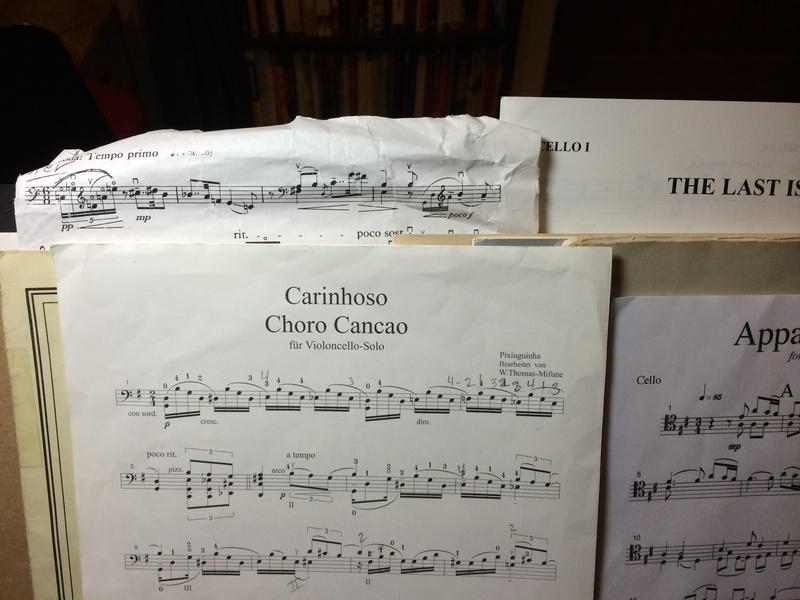 Strains of Ravel will waft through the stacks at Powell’s on Burnside at 1:00 The principal strings of the Oregon Symphony — Sarah, Chien, Joël and Nancy — will be in the 3rd floor Basil-Halwood Art Gallery playing one of the most beloved works for string quartet. We will have flyers with information about the series, and magnets. Yes, swag! Hope to see you there! I’m not quite back on track to post performances of each Bach Suite movement, but I got a new iPad audio app and recorded a some run-throughs of a piece I’m working on for, drum roll, please…a house concert! It’s still a work in progress, but reasonably listenable and such a lovely piece, I decided to share it. I am writing today to ask you to support something I am passionate about: the Oregon Symphony. 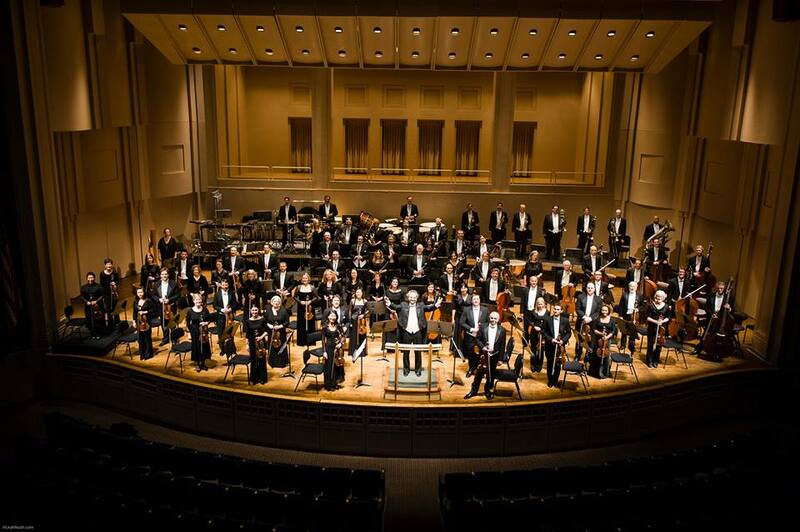 You may have read the Oregonian article this week about financial concessions the musicians have given the Symphony to help balance the budget. This was a real sacrifice from each of us – two and a half weeks of pay is a big deal. We musicians took this step because we know the Oregon Symphony is a treasure in the community, offering live symphonic performances at the Schnitz and providing music education services for 20,000 kids every year. We’re so proud of our achievements in recent years! We know that it takes longer to rebuild than it does to tear down, and preserving this institution, which has been built by the whole community over the course of 117 years, is worth the sacrifice. Even with this concession, the Symphony still needs help. Your support will make us a stronger organization and a stronger orchestra, so please join me today in making an investment in the Oregon Symphony. Gifts of any size are appreciated and will be matched by one of our generous Board Members. Click here to make a gift today. We’ll be playing at West Linn Lutheran. Support for arts organizations is crucial for arts education, which is itself crucial for all education! It is pretty obvious that I have had a hard time getting this blog rolling. I haven’t ironed out all the logistical details for making video, and now that I’ve injured my hand, I can’t play for a while longer, in any case. But this is my online sandbox, to play in how I please, so today I’m posting a plea to vote yes for Portland’s “Arts Tax,” ballot measure 26-146. In spite of how very badly we need the revenue, however modest, I was not sure until recently if I would vote “yes” myself, mainly because I was concerned about the regressive nature of the tax. My concerns were put eloquently to rest by the discussion with CAN’s Jessica Jarrett Miller on OPB’s Think Out Loud. Last week, there was an article on page 1 of the Metro section in the Oregonian referring to “Quirky Aspects” of this measure, focusing on complaints by education advocates that not all the money would go to schools. I wrote a letter to the editor in response to that particular complaint. I haven’t seen any further discussion of this or any other merits of the ballot measure in the paper or online (which I could have missed, admittedly, although I did look) so I am posting my (hurriedly written!) letter here. There are still many people undecided about this, so it is worthwhile to keep the discussion going. Education advocates are complaining that part of the revenue raised by Measure 26-146 would go to arts organizations and not all directly to schools. I would like to contest the notion that this undercuts its value to students and to the community. First of all, it is called “Schools & Arts Together,” so it isn’t at all excessive that about a quarter of the proceeds are devoted to arts organizations. Beyond that, I believe that this fund would not succeed in its purpose if it didn’t include some contribution to these institutions. Top level professional artists and arts organizations are the aspirational, inspirational exemplars and torch-bearers for the artistic spirit in every student and citizen. While there is no substitute for creating your own art and for having your own direct experience with performance and creation, nor is there any substitute for attending a concert, opera, ballet, or play put on by the world class professionals who live and work in your community. Students who come to the Schnitz for our Youth Concerts will hear CDs at home in a whole new light, and if they participate in band or orchestra, will have had their imaginations fired up about the possibilities in the music they play. Imagine a couple who’ve started ballroom dancing classes and go to the ballet; they not only appreciate the dancing they see all the more, but they take that inspiration back to their studio, the memory of that grace and power and skill echoing through their movements. The Oregon Cello Society members who hear Alban Gerhardt play with the Oregon Symphony this weekend will also have the opportunity to hear him coach student cellists — a major artist in town only because a major symphony exists here to bring him — and they will practice their own music with a fresh image of what the cello can do. Arts institutions like the Oregon Symphony already have significant education outreach in place not only because they see the need, but because those activities are natural emanations of their passion for their art form. They offer discounts for students, take programs directly to schools, and bring school groups to their venues. They deeply desire to be available to all who want to partake, so they do what they can to make their offerings affordable, such as participating in RACC’s Arts for All program. (Look it up; it’s fantastic!) In our city, major arts institutions have long depended disproportionally on a small number of philanthropic individuals. In these times, when it takes all hands on deck to even survive, consistent support from the broader community, however modest, would mean so much and make such a difference. 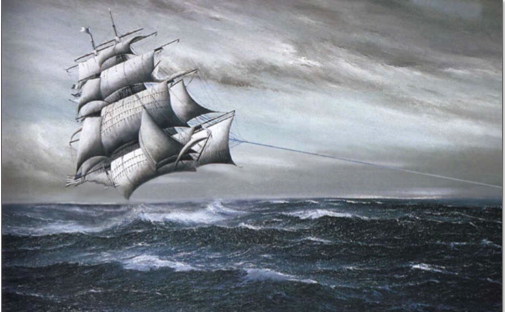 I find myself looking for a metaphor to describe what I know in my gut about the critical importance of high-level professional arts groups in our community….Perhaps they are the sails on the sailboat that holds the creative drive of our city, and of its students of all ages: They take it places and give it wings. Hey, at least it’s on four strings! It’s a lovely rendition, very delicate. Without the baritone resonance of the cello, a different mood is created and without the sustaining power of the bow, the performer depends particularly on subtle rhythmic variation for shaping and emphasis. Still, it is without a doubt the same piece of music. “Absolute” and “universal” indeed. How far back do you want to go? Staying on topic, how about the genesis of J.S. Bach’s musical métier. 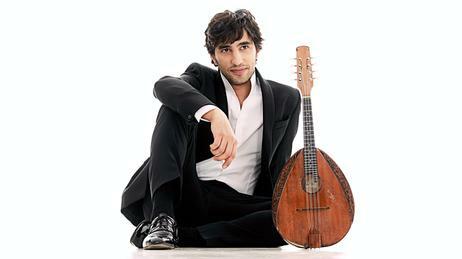 I think most people with either a music education or long-time interest in classical music know that J.S. had composer sons, including C.P.E., J.C., and W.F. (I am being just a little silly here; Wilhelm Friedemann, the eldest, is not generally known by his initials.) What I didn’t know before is that music was the Bach family business long before J.S. came along and that our hero was the scion of a deeply rooted musical family in the German state of Thuringia. Thuring-who-a? Color me ignorant, but that would be terra incognito to me. 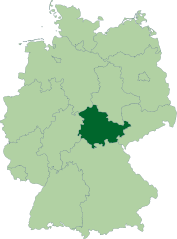 Thuringia: “Green heart of Germany,” Lutheran heartland and “Freistaat Thüringen” (Free State of Thuringia). During my limited youthful travels in Germany, Thuringia was not even on my radar, probably because it was part of the DDR, East Germany. Since reunification, it has remained a relatively poor state economically, cherished for its scenic beauty. In the cultural sphere, Thuringia has some truly impressive name-dropping rights: Martin Luther, Goethe, Schiller, Bauhaus, and (of course!) Bach. Veit Bach (d. 1619) was a baker — a “white-bread baker” to be exact, a fact that sent me on a web odyssey in search of bread history (Digression danger alert! Did you know Germany produces more varieties of breads than any other country?) — who fled Hungary because he was a Lutheran. He settled in Wechmar, a village in Thuringia, presumably because of the aforementioned Lutheran heartland attribute. His predilection for music was expressed through the cittern, a type of lute, and family lore described him strumming along to the rhythm of the millstone while the flour was being milled. A Horn Pype performed by Jacob Heringman shared on The Renaissance Cittern Site. In our day, the music of J.S. Bach is synonymous with classical music, but in his own day, the name Bach was synonymous with musician. What is it about this little piece of music that enchants us so? The first two notes are the middle two open strings, G and D, the warm heart of the cello’s register. The rhythm couldn’t be simpler, running sixteenth notes, and at first, there’s really no melody per se, just arpeggiated chords. This opening bears a marked resemblance to the opening of The Well-Tempered Clavier, and the prolific cellist Peter Wispelwey even built a recording around that idea, including a transcription of that keyboard Prelude in C BWV 846 transposed from the original C to the G Major of the first Cello Suite. If this Prelude is so much like a keyboard piece, why is it considered so archetypically cellistic? Then there are the decisions. A mechanical rendition, rhythmically accurate and steady (much like my performance excerpted above from a recital in 2000, I’m afraid) can be attractive, but would hardly seem likely to inspire and transport generations of listeners from all walks of musical life. Tempo (how fast or slow), articulation (separated or connected, and how much so), dynamics (loud, soft, rising, falling, etc.) — these basic tools of musical craft are wide open to interpretation here, more than in most of the music we play. (More about that in future posts, you can be sure!) It is protean, elemental, a veritable Rorschach test in G Major. I just returned from a ten-day trip without a cello. It’s good to do that once a year or so, physically and mentally healthy, but I have to admit that I didn’t particularly feel like I needed it. Coming off the last Symphony season, which ended a month ago, I felt in tip-top condition, cellistically speaking, and raring to go. This is was unusual. I have often ended the season feeling depleted and a bit bruised and welcoming the clearing of the calendar and the sudden release from the pressure to perform. One thing that was different about last season was that I had fewer students than in previous years. This was a conscious choice. Although we have weeks that are not all that busy and programs that don’t require all that much practicing, there are plenty of weeks when having even ten students can be a too much. It’s not only hours, it’s energy and mental space. The productive time in the course of the day, and especially the mental energy, that goes towards teaching a lesson has to come from somewhere, and that tends to be be from my own practicing. Or resting! I missed having more students, to be honest, but I know it was the right thing to do. I genuinely enjoy teaching, I love the connection to the students, and to their families, who often give me a lovely sense of community. Since my family is far away and I only see them a couple of times per year, this is a nice icing on the professional cake. It’s true that teachers learn through teaching and my students are a source of inspiration and satisfaction to me. I share their struggles and triumphs, and I have the tremendous satisfaction of having the keys to their musical dreams. Their excitement feeds mine and seeing the music and the cello through their eyes keeps me from becoming jaded and stale. Of course, a vacation helps that as well. I went to Belize with my adventuresome Mom. We stayed on Ambergris Caye and did some Scuba diving. We ended the trip at the Lamanai Outpost http://www.lamanai.com/ bird-watching and toured Mayan ruins. 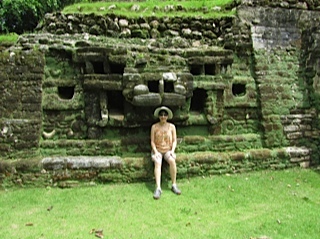 At the base of one of the Mayan temples at Lamanai, Belize. A couple of months ago, someone dropped a camera on one of the relics — a skull from around 900 AD — and broke it, so cameras are no longer allowed. 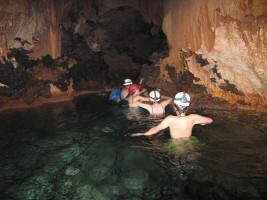 There is a 45 minute hike there and back through the jungle, and the time in the cave is more than half in water from knee-deep to chest-deep. When we emerged, my waterlogged fingers looked really strange. My cello callouses were stark white! Each of my slightly bulbous left finger-tips, two of my right fingers from pizzicato and a spot on the right thumb from the bow. I wish I had a picture. Even if I wanted to soak my hands into prunes now, I wouldn’t have such dramatic callouses after such a substantial vacation. This is "My Big Bach Blog" because I will be exploring, one at a time and in order, each of the thirty-six movements of the 6 Suites for Solo Violoncello by Johann Sebastian Bach. The world doesn't need this…but I do. I'm a professional cellist who has played the Suites many, many times, but I expect to experience this iconic music in a new way by going through it systematically and with a fresh perspective. I get a lot of pleasure and inspiration from house concerts -- informal performances in intimate settings for interested -- and interesting! -- people, so that's the spirit in which I'm going to approach each installment. I welcome questions and comments!